At Serrão Rejuvenation Center, Dr. Serrão – a board certified gynecologist and post-graduate trained cosmetic surgeon – offers a number of non-surgical treatments for fat reduction and cellulite treatment for women in Orlando, Winter Park, and the surrounding areas of Florida. The various options that we offer for fat reduction and cellulite treatment allow our highly trained healthcare team to provide the perfect solution for you, based on your individual needs and desires — including body sculpting to help trim stubborn fat and cellulite treatments to smooth the dimples in the skin. It is important to note that non-surgical fat reduction is not a weight loss treatment. This procedure is best suited for treating very limited volumes of fat of the abdomen, flanks, back, and thighs. Because larger volumes of fat require multiple non-surgical treatments, liposuction is probably a better option for larger fat accumulations. These treatments are all outpatient with little to no downtime and minimal discomfort. Please be aware that multiple treatment sessions may be needed to produce satisfactory results. Arasys Lose inches and tone muscles. Cellfina™ Minimally invasive, proven treatment that breaks the bands under the skin that cause cellulite. Endermologie A series of treatments to reduce cellulite, contours your body and tones your skin. Requires maintenance sessions. Lipomassage performed for post-operative liposuction healing. Kybella® First FDA-approved injectable treatment to contour and improve submental fullness and double chin. Thermage® A single radio-frequency treatment that tightens lose skin and contours the body. Arasys is a safe, non-invasive and FDA-approved treatment that was invented by Jerry Pollock, the inventor of the pacemaker. Arasys uses state-of-the-art microcurrent technology for inch reduction and muscle toning. The fat burning and muscle toning effects of four hours of intense exercise are reduced into each 30 to 45 minute session. A series of at least six sessions is recommended. It mimics the effects of deep, concentrated exercise without the pain, sweat, or soreness. Certain medical conditions are contraindicated and a consultation is required to see if you are a candidate. Cellfina™ is the only FDA-cleared, long-lasting, minimally invasive solution proven to smooth away dimples for at least two years in a single treatment — the longest FDA clearance for a cellulite treatment. Learn more. Endermologie is a unique, non-surgical, non-invasive way of reducing cellulite and reshaping the body. It reduces cellulite and improves overall fitness by using a patented form of rollers, suction, massage, and vibration therapy. Since its introduction to the USA, Endermologie was the first to be FDA-approved for temporarily reducing the appearance of cellulite and inch loss. Its safety and efficacy have been the subject of several clinical trials and research continues to reveal positive results. 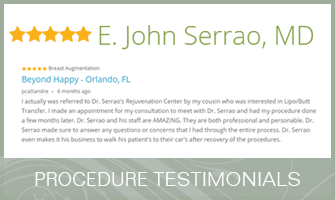 Serrão Rejuvenation Center was the first practice in Orlando to introduce Endermolgie in 1999. Larissa Serrão RN, an Advanced Certified Endermologist, has been featured on Channel 6 News WKMG for her expertise in the treatment of cellulite. Kybella® is a fat-melting injectable drug. It is the first and only FDA-approved injectable treatment that contours and improves the appearance of submental fullness, sometimes referred to as “doublechin”. Kybella® is made from deoxycholic acid, which is a chemical produced in the body to help absorb fats. When injected into the fat below the chin, known as submental fat, it destroys the fat cells. Learn more. 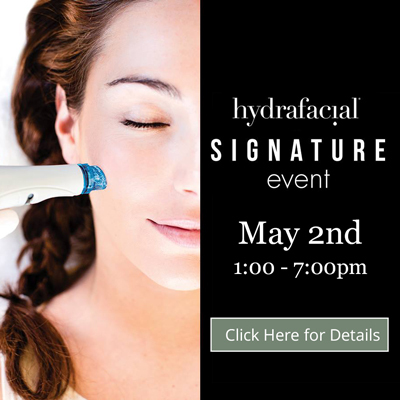 Thermage is a safe, clinically proven way to tighten and contour skin, with improvements in tone, contour, and texture occurring naturally through the stimulation of your own collagen. Thermage is completely non-invasive: no surgery, no injections. A single treatment uses radiofrequency to heat the skin which tightens your existing collagen and stimulates new collagen growth. Improvements are both immediately visible and continue up to six months. Results can last for years depending on your skin condition and aging area process. Dr. Serrão is certified in all applications of the Thermage procedures. The treatment itself is normally done as a single treatment that takes from 20 minutes to two hours depending on the treatment area. Learn more. Vanquish ME destroys fat cells through dermal heating that is produced by radio frequency energy. The contents of the cells are released into the blood stream and are either used for energy or eliminated naturally. The design of the Vanquish ME system means that the size or location of the treatment area is not a limiting factor. Vanquish ME is recommended for patients who may be overweight, as well as those who only have localized areas of fat. Learn more. Learn more about fat reduction and cellulite treatment for women in Orlando, Winter Park, and the surrounding areas of Florida. Contact Serrão Rejuvenation Center to schedule a consultation and begin your rejuvenation today with Dr. Serrão, a board certified gynecologist and post-graduate trained cosmetic surgeon. Arasys – Lose inches and tone muscles. Cellfina™ – Minimally invasive, proven treatment that breaks the bands under the skin that cause cellulite. Endermologie – A series of treatments to reduce cellulite, contours your body and tones your skin. Requires maintenance sessions. Lipomassage performed for post-operative liposuction healing. Kybella® – First FDA-approved injectable treatment to contour and improve submental fullness and double chin. Thermage® – A single radio-frequency treatment that tightens lose skin and contours the body.